your glasses can fall and break when you want to specifically reach for the one you need. With this solution everything will be protected like new, chip and breakage free. Professional Kitchen Set-Up: You can feel like a gourmet cook simply by keeping your kitchen organized, neat and tidy. Cooking, baking and cleaning your kitchen will be a lot easier when your kitchen cabinets and counter is organized and crisp clean. Marvelous Gift Idea: If you need a great gift suitable for any occasion or holiday and sold for an affordable cost, you are looking at the right page. Get this beautiful stemmed glass storage solution for a housewarming, Christmas, New Year's or just because. organize your stemware collection, easily reach for a fluted glass when you want to drink wine. 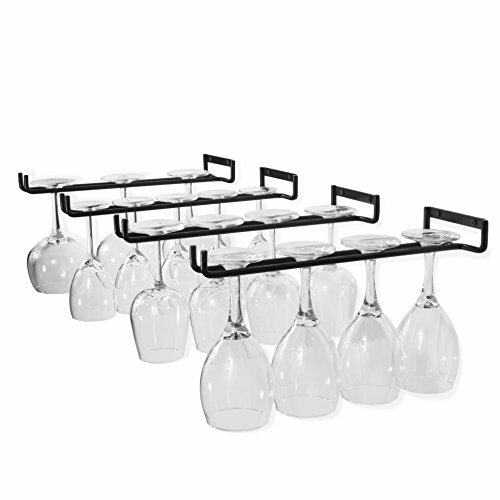 Each Rack's Dimensions: Glass Holder L 15" Wall bracket W 5"
Wine Glasses at Your Service for Easy Dining. Click Add to Cart NOW to Order in the Comfort of Your Home. Easy to Install: Made of good craftsmanship, these 15" x 5" wrought iron stem racks come ready to use with the necessary hardware for easy installation, so mounting this on your empty wall space will be a breeze. Sturdy Construction: Depending on the size of the glass, each stemware drying rack can hold up to 3 to 4 wine glasses with ease. You can store 3 of your bulky, hard to store wine glasses with this mounted inside your cabinetry or wall, so your glasses are easy to reach and safely stored. Great Quality: The 8.5mm wrought iron material is built to last you a lifetime with 100% satisfaction guaranteed. The quality of the sturdy iron material is durable and dependable, so keeping your stemware chip-free is no longer a hassle. Organizational: With this set of 4 bundle, you can easily create more room on your counter, cabinets, bar cart, server, buffet, hutch, credenza and more. Install both on the same space or utilize each one separately to maximize function. Bar Storage Done Right: Install these racks above the bare wall space over your bar cart to keep your liquor bottles and stemware easily stored in one place and at your fingertips. Pour yourself a glass of wine and enjoy some mindfulness after a long stressful day at work. If you have any questions about this product by Wallniture, contact us by completing and submitting the form below. If you are looking for a specif part number, please include it with your message.